You may notice something on this site. I know it’s subtle, but you’re the sort of person who clicks on pages with provocative titles like “Round Numbers” so I’m sure you noticed the lack of marketing psychology pricing around here. Marketing Psychology Pricing – Really? Yes, I know there’s been gobs of studies done that prove that more people will buy a $99 Bagel-Heat-O-Matic than a $100 Bagel-Heat-O-Matic, and, yes, there have been persuasive papers written explaining why pricing your Widescreen Insist-O-Vision LCD TV at $999.97 will move more inventory than if the price tag said something shocking like $1000, but so what? You’re not an LCD TV and I’m not a big box retailer. Now, to be forthright, my math major side is nerdishly amused by the idea of sequentially numbered fees like $1234, or prime numbers like $3 or $4259, even esoteric Fibonacci inspired prices like $1123.58, but when it comes right down to it my approach is about getting real, clearing the mental clutter and being authentic. So I say let’s celebrate the whole numbers, good old-fashioned base-10 pricing (yup, still a nerd). God gave us the integers, all else is the work of man. ~ L. Kronecker. I hope you’ve found the collar of this website to be blissfully free of starch. There is a time and a place for formality in business, but that’s what the lawyers are for. My job is to help you dig into your core, so we can help you surface the things that will help us build an authentic brand for you. Sometimes those things are a bit squishy, sometimes they are tucked behind layers of limiting beliefs, or hiding behind some unchecked business baggage. To wade through all of that we need to have some real conversations. This is one of the things I love about my job, we get into some juicy hug-inducing conversations sometimes, but to do that I feel you should know what you’re getting into. I’ve tried to make this site a reflection of my personality, humor and point of view. That way you can decide for yourself it is a magnet drawing you into my arty-nerdy mindset or if it is a filter preventing you from wanting to go further. If the former, then welcome aboard! If the latter, well, I’m a little surprised you’re poking around this odd little corner of the site, but hey your welcome to stick around, the bunnies don’t bite. 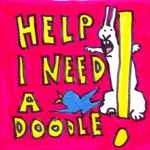 Doodling – Seriously What’s Up with the Bunnies? Did I mention, both left brain AND right brain? Art teacher and technologist. Entrepreneur and technician. I’m a hybrid, a mutt, and a pragmatic optimist. Believe me I know how challenging growing a business can be – How scary it is to have loans and payroll and taxes to contend with – How mean people can be – How weird and scary the geo-political climate is and how surreal and terrifying the thought of global climate change is…. but I figure you know all those things too, so why make art about that? 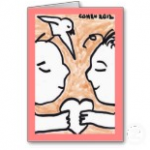 I’d rather celebrate the good stuff, get a little silly, offer a bit of whimsy to the world. My art is about investing in smiles, I think their contribution to our future as a species is woefully underestimated. 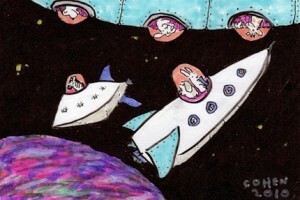 So here are some more bunnies… in space!